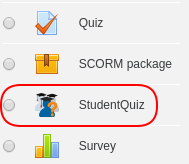 StudentQuiz enables students to collaboratively create their own question pools within Moodle. Students can filter these questions into quizzes, and they can rate and comment on questions while working through the quizzes. StudentQuiz computes each students contribution and learning progress and compares this with the community. The created questions become part of the Moodle question bank and can be reused in other Moodle quizzes. It would be great to add this plugin to core. The first step will be to review the code in more detail.